This was the third run of David Alden’s production of Lucia di Lammermoor at the ENO. Set in the traditional 1820s in what appeared to be a derelict old manor home, the monochrome colour-palette was purposefully dreary and repressive, reflecting the dark nature of the piece and creating an uneasy sense of imprisonment for the audience. It was minimalist in that it suggested certain images to the audience, leaving the rest of it up to the imagination. The remains of Edgardo’s apartments at Lammermoor Castle were simply the reverse side of the set walls, The damaged and dark halls of Ravenswood felt more like a prison than a home, and the graveyard depicted in the final scene of the opera is simply a collection of old portraits strategically placed around the stage. The set with its cold and unchanging light was meant to make the audience feel uneasy and trapped. 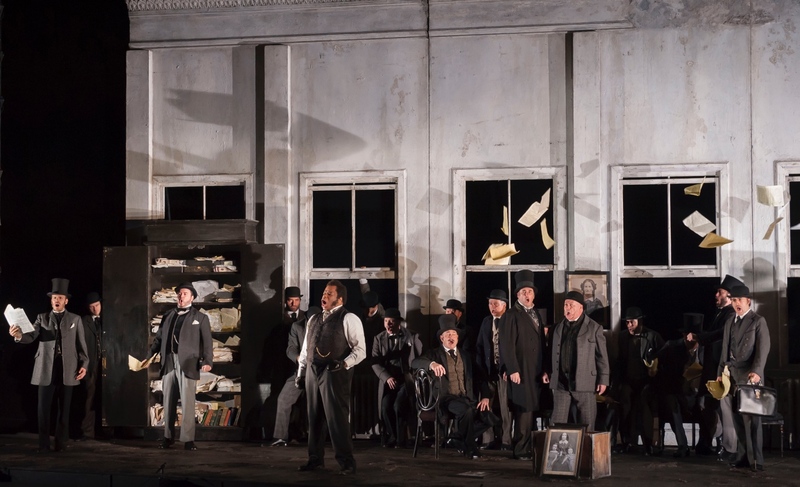 Lester Lynch (Enrico) and the ENO Chorus in Lucia di Lammermoor, English National Opera, 2018. Photo: John Snelling. To add to the discomfort, the staging was slightly mechanical. Each gesture was choreographed and timed to fit perfectly with the music, a stylistic choice that would not have been my preference but did add to the surreal, creepy quality of the piece. Lucia’s opening scene was particularly representative. Performing on a small stage within the stage, she was stilted and mechanical in her movements, almost doll-like, which seemed to be a theme woven throughout the opera. Later, in an unnerving scene, we see Enrico stroking the hair of one of Lucia’s dolls as he awaits her. We are meant to see Lucia as this beautiful doll; a thing for people to play with. 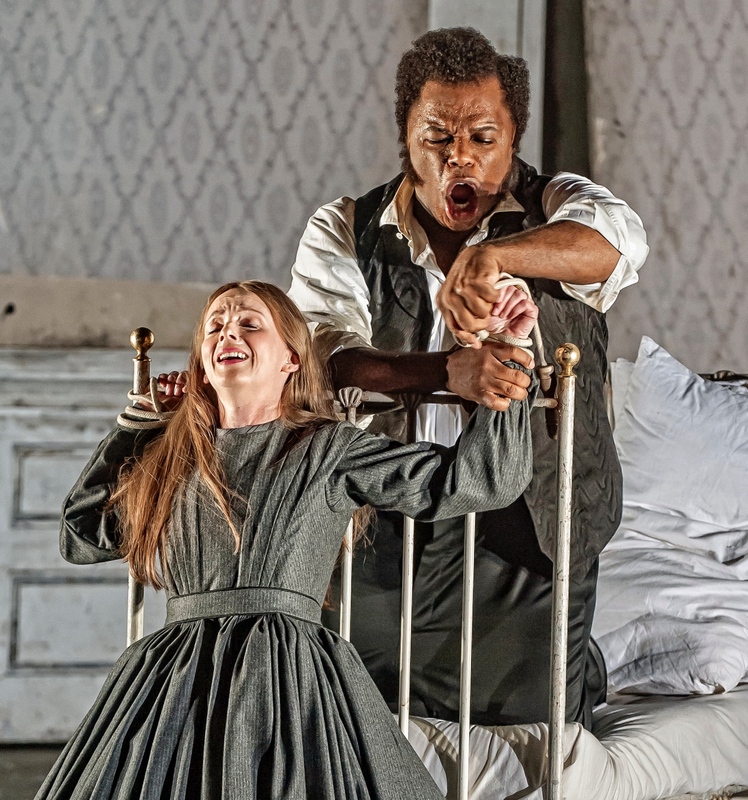 Sarah Tynan (Lucia) and Lester Lynch (Enrico) in Lucia di Lammermoor, English National Opera, 2018. Photo: John Snelling. There have been many difference approaches to the character of Lucia over the years. This production made the decision to have both Lucia and Enrico portrayed as quite youthful. Lucia’s dress, childlike playfulness, and connection to her childhood objects suggested that she was just on the cusp of adulthood. Enrico likewise, was bounding with youthful masculine energy. This made the ensuing events all the more chilling but admittedly, though it did provide context for Enrico’s character which helped me to better understand him, one could not forgive his cruel and incestuous behaviour towards his sister. Eleazar Rodrìguez (Edgardo) and Sarah Tynan (Lucia) in Lucia di Lammermoor, English National Opera, 2018. Photo: John Snelling. He is a young man, irresponsible and cruel, accustomed to getting what he feels is owed him. Only recently coming into his power after the death of his father, he has no means of controlling it. He was played by baritone Lester Lynch, who was making his house debut. It was an extremely powerful and commanding voice but his character was forced and unconvincing. Sarah Tynan in her role debut as Lucia gave a calculated and safe performance. The voice was beautiful, light, and fluid but the infamous Mad Scene was tame and her Act I love scene with Edgardo, tepid. In a piece where passions run wild, I would have liked to see these characters getting more carried away. 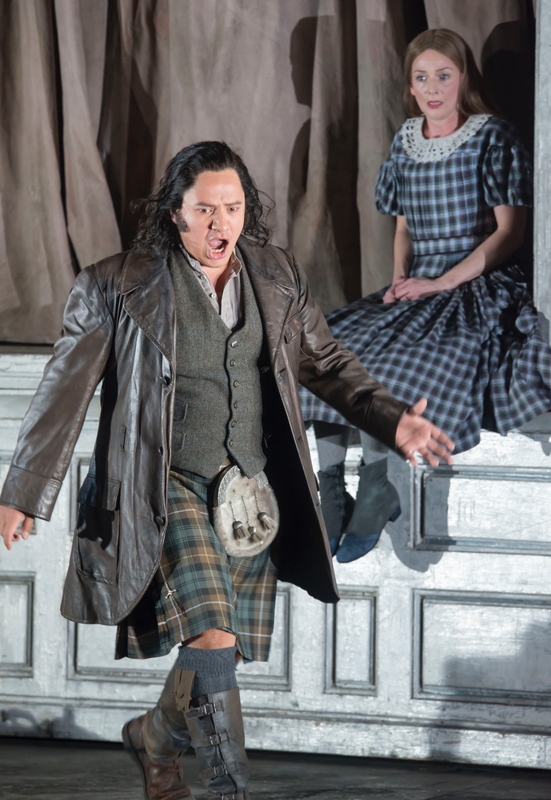 Michael Colvin (Arturo) and Clive Bayley (Raimondo, background) in Lucia di Lammermoor, English National Opera, 2018. Photo: John Snelling. 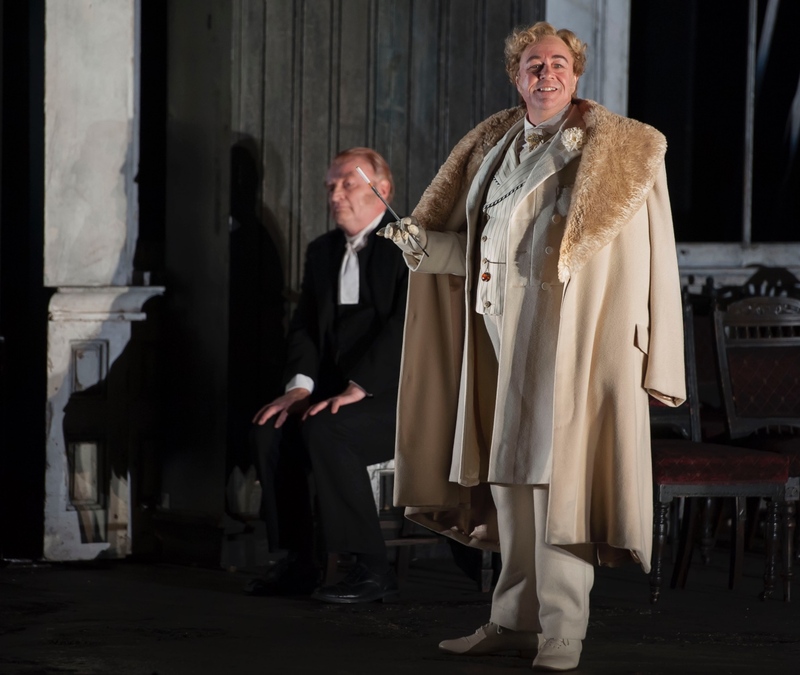 Tenor Michael Colvin brought a sense of light and humour into the production as Lord Arturo in his act two entrance scene. His character was detailed and expertly executed. He was so pleasantly received by the audience I think because his character was recognisable and relatable in his self-obsession. Sarah Pring’s Alisa had so much presence and self-assurance. She was captivating to watch particularly as she began to unravel alongside Lucia towards the end of the opera. Her miming of playing the glass harmonica in the third act was one of the most beautiful and hauntingly strange moments of the the entire opera. 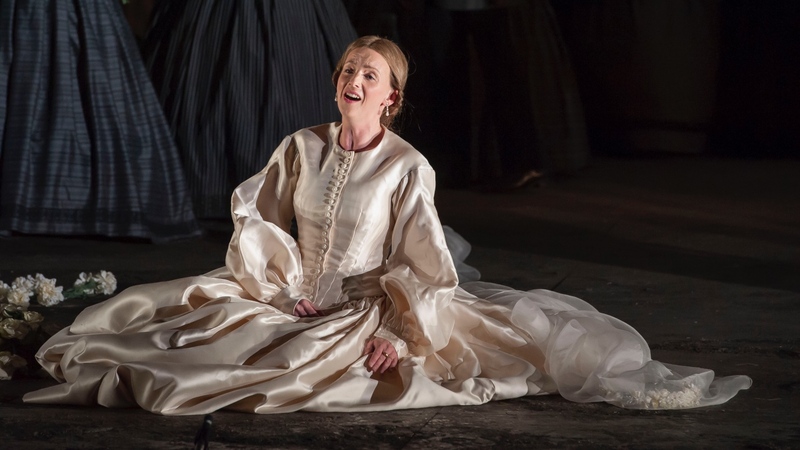 Sarah Tynan (Lucia) in Lucia di Lammermoor, English National Opera, 2018. Photo: John Snelling. Bass Clive Bayley was a convincing Raimondo despite some questionable liberties taken with the voice. His character had depth and complexity despite being a supporting role. He played the guilt-ridden, religious extremist well and when he could have simply faded into the background, he became instead another dark and conniving conspirator vying to control Lucia’s future. Eleazar Rodriguez’s Edgardo was as dashing and romantic as one could hope for and yet the passion between the two lovers seemed to be lacking, causing his suicide in the final moments of the opera to be rather underwhelming. I found Alden’s production be be a challenging one. I think that’s the nature of this piece. The subject matter is very dark and though I appreciate that it didn’t shy away from depicting the violence done to Lucia, I was left unsatisfied with the way it was handled. Let’s face it; a lot of the opera written in the 18th and 19th centuries is centred around victimised, shamed, and abused women. How we handle telling these stories in the 21st century is everything. The treatment of Lucia by the men in her life is horrific, and tragic. I wanted to see her fight back. I wanted the murder of Arturo to feel like her attempt to set herself free. But instead, I was made to feel that her madness was a tragedy, an inevitable result of the mistreatment she faced, and that we should pity her. If we are going to continue to tell these stories, I would like us to work harder to tell them in a more insightful way that accurately reflects the strength of the women who have had to face similar repression.